More news arrives from Michael White and Peter Thompson at Ocean Independence as they sign a joint central central agency for sale with Pacifica Yachting on the 41.5m high performance motor yacht My Toy. 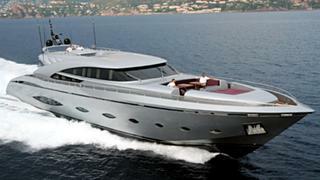 Built by Italy's AB Yachts in 2009, My Toy is the largest yacht from the yard currently for sale. Accommodation is for eight guests in four elegant staterooms although there is the option to convert the gymnasiun/sauna into a fifth suite to allow for 10 guests in all. Three 2400hp MTU engines power her to an exhilarating cruising speed of 36 knots. Lying in Turkey, My Toy is asking €9.8 million.